I admit without any hesitation and regret that I do not like people knocking on my doors unless I know them already. When I want or need to interact with the outside world, I go out into it. However, when I am home, I enjoy my privacy. When I want to interact with strangers, I do not go home and lock the doors. Needless to say and write, I usually avoid speaking with people who knock on my front door with the intention of converting me. Mormons and Jehovah’s Witnesses are easy to recognize; I simply refuse to open the door. This strategy is more effective and easier than my previous one, which was confusing them with my superior knowledge of comparative religion and Christian theology and history until they left. I recall one unpleasant encounter with two Church of Christers, to whom I spoke honestly. I also remember them telling me that I was going to Hell for not belonging to the Churches of Christ. My Anglicanism, influenced by Lutheranism and Roman Catholicism, does not meet with the approval of such members of the Churches of Christ. I am certain that more than one person regards me as one of those who rejects the Gospel and consigns me to the judgment of God, as in the Gospel pericope. The message of God has outlasted Philistines, the Roman Empire, and the martyrdom of St. Paul the Apostle. It has survived rejection by many people. The message of God will outlast all of us. We can either reject or accept it, but we cannot halt it. Depending on how we act, we may condemn ourselves. Almighty and most merciful God, your bountiful goodness fills all creation. and day by day I will fulfill your vows. In the assigned readings for these three days we read of people accepting and recognizing God or doing the opposite. Jews and Gentiles alike accept and recognize God. Jews and Gentiles alike do the opposite. The standard of acceptability before God has nothing to do with national identity. The truth I have now come to realize is that God does not have favorites, but that anybody of any nationality who fears God and does what is right is acceptable to him. Nationalism is inherently morally neutral. What people do with it is not morally neutral, however. These applications can be positive or negative. Nationalism seems to be a human concern, not a divine one. As we seek to build up our communities and nations may we not label those who are merely different as dangerous because of those differences. Many of them might be people of God, after all. Others might become followers of God. Furthermore, many within our own ranks might not be devout. Compassionate God, you have assured the human family of eternal life through Jesus Christ. in your Son, Jesus Christ, our Savior and Lord. Amen. to my God I cry for mercy. We read of forgiveness in the lections from the New Testament. Saul of Tarsus receives forgiveness and a new mandate from God. (Grace is free yet not cheap.) Jesus forgives a man’s sins during a healing in Matthew 9. Critics who are present think that our Lord and Savior is committing blasphemy, for their orthodoxy makes no room for Jesus. The healed man becomes a former paralytic, but Christ’s critics suffer from spiritual paralysis. The language of 2 Samuel 14 indicates that King David has not reconciled with his son Absalom, who had killed his (Absalom’s) half-brother, Amnon, who had raped his (Absalom’s) sister, Tamar, in the previous chapter before he (Absalom) had gone into exile. The entire incident of pseudo-reconciliation had been for the benefit of Joab. The false reconciliation proved to be as useless as false grace, for Absalom, back from exile, was plotting a rebellion, which he launched in the next chapter. The juxtaposition of Saul of Tarsus/St. Paul the Apostle, the paralyzed man, and Absalom is interesting and helpful. Both Saul/Paul and Absalom had egos, but the former struggled with his self-image as he made a pilgrimage with Jesus. Absalom, in contrast, did not strive to contain his ego. No, he permitted it to control him. We know little about the paralyzed man, but we may assume safely that a runaway ego was not among his problems. If we are to walk humbly with God, we must contextualize ourselves relative to God. We are, in comparison, but dust, and God is the proper grounding for human identity. Proper actions will flow from appropriate attitudes. I scanned the image from a Bible salesman’s sample book from the late 1800s. The volume is falling apart, unfortunately, but it is quite nice to have nevertheless. O God, form the minds of your faithful people into one will. and the Holy Spirit, one God, now and forever. Amen. 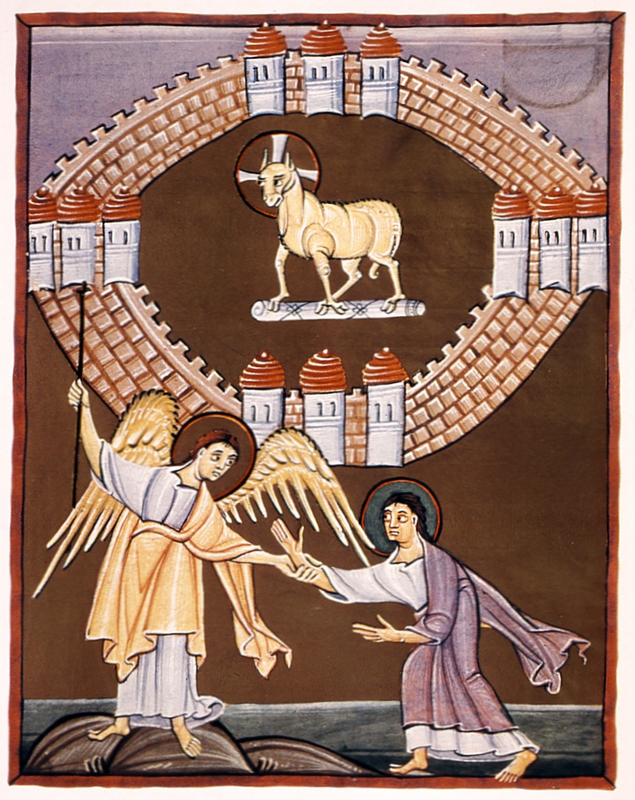 The reading from 2 Chronicles depicts the Presence/glory of YHWH filling the new Temple at Jerusalem as a cloud, just as Exodus 40 depicts the divine Presence/glory filling the Tent of Meeting as a cloud. King Solomon used the first Temple to bolster his monarchy. He had also used forced labor to construct that Temple. Furthermore, his unjust economic policies contributed greatly to the unrest which led to the division of his kingdom after his death. YHWH’s commandments in the Law of Moses demanded economic justice, but Solomon violated those statutes. Saul of Tarsus became St. Paul the Apostle after encountering Jesus dramatically on the road to Damascus. He understood the demands of God on his life much better than Solomon grasped his duties to God. St. Paul still had some blind spots (as all of us do), but he did become a major figure in nascent Christianity and suffered much for his (active) faith until the day of his martyrdom. The Presence/glory of God was more evident in the career of St. Paul the Apostle than it was in Solomon’s Temple. Is it evident in your life, O reader? with all the angels and all the saints we laud your majesty and might. Most of the readings for these three days are stories of commissioning by God, accompanied by a spectacular vision or event. Ezekiel and Isaiah become prophets, fishermen become Apostles, and Saul of Tarsus becomes St. Paul the Apostle, the great evangelist. God qualifies the called, who know well that they are, by themselves, inadequate for the tasks to which God has assigned them. I do not know about you, O reader, but I have seen no visions and have not witnessed miraculous deeds. Neither has God called me to do anything in the same league as the tasks assigned to Ezekiel, Isaiah, St. Paul, and the original twelve Apostles. I do know some of my inadequacies, however, and affirm that God has work for me to do. Furthermore, I acknowledge my need for grace to complete those tasks for the glory of God. Each of us has a role to play in God’s design. Many of us seek or will seek to fulfill it, but others do not or will not seek to do so. God will win in the end, as the Book of Revelation tells me, so divine victory is up to God, not any of us. Nevertheless, is responding faithfully to God and accepting the demands of grace not better than doing otherwise? What is God calling and equipping you, O reader, to do? you hold together all things in heaven and on earth. but you brought us into a place of refreshment. Then I saw a new heaven and a new earth; for the first heaven and the first earth had passed away, and the sea was no more. Water can be scary, for it has the potential to destroy much property and end lives. In much of the Bible water signifies chaos. The first creation myth (Genesis 1:1-2:4a), actually not as old as the one which follows it, depicts a watery chaos as the foundation of an ordered, flat earth with a dome over it. The lections from Genesis 6-8, being the union of of various texts (as evident in late Chapter 6 and early Chapter 7 with regard to the number of animals to take aboard the Ark), is a composite myth in which water is a force of divine destruction and recreation. And the water is something to fear in Acts 27. It is no accident that, in Revelation 21, the New Jerusalem has no sea; the city is free of chaos. Professor Amy-Jill Levine, in her Teaching Company course, The Old Testament (2001), says that she does not like Noah. He, in the story, could have tried to save lives if he had argued with God, as Abraham did, she says. Maybe she has a valid point. It is certainly one nobody broached in my juvenile or adult Sunday School classes, for my first encounter with the idea came via DVD recently. Yet the story which the Biblical editor wanted us to hear was one of God’s covenant with Noah. That theme of covenant fits well with the calm and confidence of St. Paul the Apostle en route to Rome. He had a legal case arising from preaching (Acts 21:27 forward). The Apostle had exercised his right as a Roman citizen to appeal directly to the Emperor (Acts 25:11). Yet Herod Agrippa II (reigned 50-100), a client ruler of the Roman Empire, had stated that the Apostle could have gone free if he had not appealed to the Emperor (Acts 26:32), who, unfortunately, was Nero. Anyhow, Paul’s calm and confidence during the storm on the Mediterranean Sea, with the danger on board the ship, came from a positive spiritual place. That peace is the kind which Jesus bequeaths to us and which the world cannot give. That peace is the sort which enables one to remain properly–seemingly foolishly, to some–confident during daunting times. That peace carries one through the chaotic waters and the spiritual wilderness until one arrives at the New Jerusalem. That peace is available via grace. I tended my father’s sheep. my fingers fashioned a lyre. And who will tell my Lord? The Lord himself; it is he who hears. and anointed me with his anointing oil. but the Lord was not pleased with them. and he cursed me by his idols. disgrace from the people of Israel. Saul knows David at the end of 1 Samuel 16 yet has not met him at the beginning of Chapter 17. This is a major narrative discrepancy, evidence of the weaving together of different documents. That is a scholarly matter, and I like such things. But this is a devotional blog, so I focus my attentions in that direction. 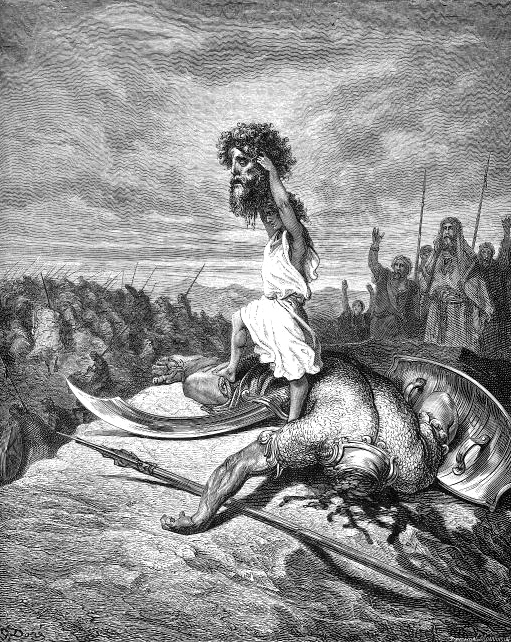 The story of David and Goliath demonstrates the triumph of faith over physical strength. That excellent sentence provides a means for understanding not only 1 Samuel 17 but the life of St. Paul as a Christian. One man proved crucial to Christian and world history. The might of the Roman Empire, which executed him, proved powerless to quash Christianity. As for St. Paul in Acts 25:13-26:32, he stood before Herod Agrippa II, the last of the Herodian Dynasty and a client ruler for the Roman Empire. Herod Agrippa II’s realm shifted according to Roman imperial decisions, but he did reign from 50 to 100 CE. He, considered a religious leader, appointed the High Priest yet carried on an incestuous relationship with Bernice, his sister. Yet this was the man who noted that St. Paul, if he had not appealed to the Emperor, could have gone free. Unfortunately, the Emperor was Nero. over the heritage of the upright….